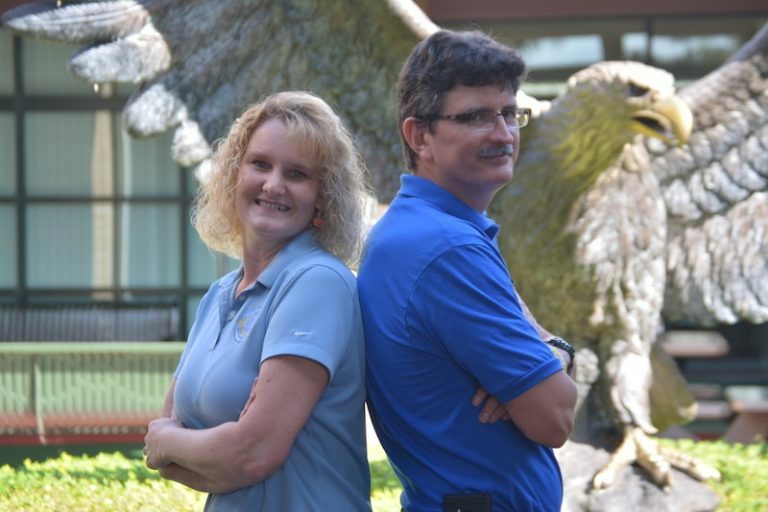 Staff and students at Hillsborough Community College’s Plant City campus were surprised but supportive when they found out that Nicole Hamilton and Tim McArter would be competing in the Dancing with the Locals competition Friday, Nov. 13. Hamilton is the student services manager at the Plant City campus and has worked for the college for 10 years. McArter, who has lived in Plant City since 1976, started at HCC as a part-time student in 2004 and later became a full-time employee in 2007. He is currently a staff assistant and a club adviser. Hamilton decided she wanted to participate in the competition when the campus president, Dr. Martyn Clay, made a general announcement about the event. “I love working at Plant City and networking with the community,” Hamilton said. The Lutz, Florida native asked McArter to be her dance partner. The two have worked together for five years and have become closer friends through their new dancing endeavors. Neither Hamilton nor McArter have attended the annual competition before, but they are practicing as much as they can. In addition to lessons from Kevin Rios at Just Dance, in Lakeland, the pair also practices at the John R. Trinkle Center during their lunch break on weekdays. “It’s right around the corner,” McArter said. For the upcoming competition, the pair will be going all out — their routine includes elaborate costumes and a cage. Their song choice is one that everyone in the audience is sure to know, but they won’t disclose it until that night. Though the song isn’t too serious, the reason for the competition is. Both Hamilton and McArter are excited to participate in an event that gives back to the community. “For what it’s for, I think that makes it pretty cool,” McArter said. What style of dance will you be doing? Nicole Hamilton likes dance and techno music, while Tim McArter enjoys old-school pop, including the Bee Gees, Michael Jackson and Kool & the Gang. Do you have any prior dance experience? Nicole Hamilton did ballet, jazz and tap from third grade to 12th grade. McArter enjoyed street dancing to disco and pop music when he was younger.